We are starting a new Weekly Wrap Up blog. This is the place where you can find all of the content we created in just one week. We believe we are a leader in content creation at HMC…and we want to give it to you in one place. 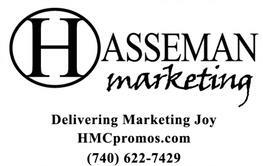 Here is what we’ve learned at Hasseman Marketing this week! We were introduced to 3 Awesome New Products for the Fourth Quarter. It’s hard to believe it, but the kids are going back to school and the 4th quarter is just around the corner. This is the time to say “thank you” to employees, customers and other contributors to your organization’s success. Check out these cool items to make sure you know about the latest. We have discovered the 5 Top Apparel Pieces for Women. Sometimes ladies apparel gets lost in the corporate world. So how do you find things that ladies would like to wear, and have a corporate look you are excited about? Check out these 5 pieces to start. Delivering Marketing Joy: Each week Kirby gets the chance to chat with some of the most innovative people in business on Delivering Marketing Joy. This time Kirby talks with Best-Selling author and Content Marketing leader Joe Pulizzi. They discuss why you need to be more patient, changes coming down the pike for marketing, and why you should have an event! Watch this one here. unScripted Podcast: Another weekly piece of content is the unScripted podcast. Bill Petrie and Kirby talk about all things marketing and promo. There are no scheduled topics, no agenda, but there are some laughs…and plenty of insight on unScripted. Listen here on PromoCorner. Jeff’s Pick: As you can see, we believe in consistency at Hasseman Marketing. Jeff takes time each week to dig into a product that “he thinks you should know about.” Jeff’s Weekly Pick this week is The Customizable Powerbank Want to keep up all the time? Make sure to join our VIP List! Our VIP’s get an email with the latest content…and other special offers as well.